Opportunities for investment in the mining sector include prospecting, expansion of existing mining projects, new mining projects, beneficiation of minerals and business opportunities resulting from links with other sectors. Beneficiation of diamonds is a particularly promising avenue for adding value to natural resources. The establishment of the Botswana Diamond Hub in the later stage of NDP10 was intended to develop a sustainable secondary diamond industry in Botswana. In the continuing expansion of diamond ancillary businesses, twenty eight (28) cutting and polishing companies have been licensed and are in operation. Although a significant proportion of these companies are located in and around Gaborone, there is also scope for establishing operations in other parts of the country. Direct Opportunities: These include areas such as diamond trading, cutting and polishing. Ancillary Support Services: These encompass the provision of specifically tailored services to the diamond sector such as banking, security, insurance, certification and brokerage services. Support and Outsourcing: Provision of general services which are not unique to the diamond industry, such as general security services, information technology and support, accounting and human resources services. Economic Spin-offs: Industries that will benefit from the growth and activity in the diamond sector such as hotels, restaurants and transportation services. 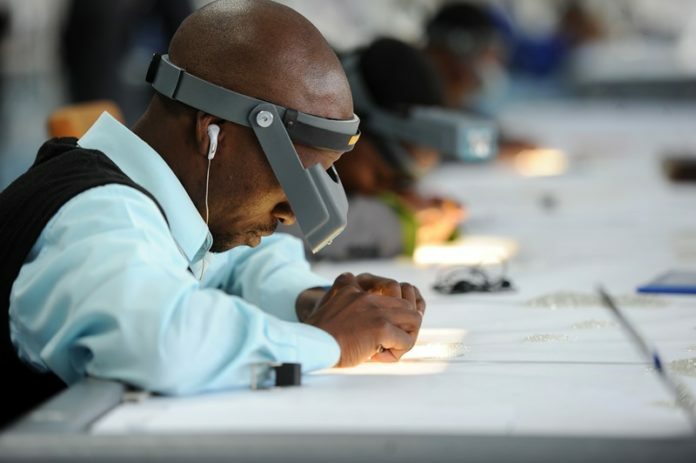 The current sales agreement offers huge potential for transforming Botswana’s economy more broadly, as well as its specific role in the global diamond industry. Initiatives driven by the private sector are crucial if maximum benefit is to be derived, while the role of Government is to ensure that an enabling environment is maintained. Frequency of diamond movements will increase with different siteholders shipping at different times; security risk, but also increased opportunities for the security industry. Potential for money laundering and other blue collar crimes increase the opportunity and potential for local security companies to participate in diamond transport and protection of diamond premises. High-speed Internet services, ICT managed services, communication infrastructure, etc. Air travel (charter services and commercial flights linking Botswana to other diamond and business centres). Local transport such as transit buses, executive taxis and limousine services, car rentals, etc. As more siteholders visit Gaborone, appropriately packaged tourism opportunities should increase. Demand for health services is likely to increase with the increase in the diamond industry population. Education needs for children of expatriates. US$3–6 billion will be transacted in Botswana every year and this will require the banking sector to be fully capitalised to participate in the transaction. Establishment of specialised banks (e.g., diamond banks). Investors in any of these areas that are interested in discussing business or investment opportunities are invited to contact the Botswana Investment and Trade Centre (BITC).